Your reference librarian had the opportunity to do some research into the Matriculation Book and ceremony last summer. Here’s some of that information, which sets out the history of the oath and the Matriculation ceremony itself. We the subscribers, Students of the General Theological Seminary of the Protestant Episcopal Church in the United States, DO solemnly promise, with reliance on Divine Grace, that we will, during our connexion with the Seminary, faithfully obey the laws thereof, and diligently prosecute all the studies, and perform all the duties, which, according to the rules of the institution, may be required of us; and, furthermore, that we will uniformly cultivate religious and moral dispositions and habits, and, by every means within our proper sphere, endeavour to promote the reputation and interests of the Seminary. 1914 revisions. The Matriculation Book contains a revised statement dated 1914. Wilford Lash Robbins was serving as dean at the time the Declaration’s language was changed. In accordance with the Revised Statutes, Chap VIII, Sec III, the Declaration to be subscribed to reads as follows. We, the subscribers, students of the General Theological Seminary of the Protestant Episcopal Church in the United States, do solemnly promise with reliance on divine grace, loyally to observe the Statutes and Rules of the Seminary; to prosecute the studies, and to perform the duties, which may be required of us; and furthermore, to set ourselves to cultivate the moral and religious character which befits candidates for the Sacred Ministry. Note that the students no longer swear to “faithfully obey the laws of the seminary,” nor must they promise to “by every means within our proper sphere, endeavor to promote the reputation and interests of the Seminary.” Instead, they are to conduct themselves in a manner befitting future clergy. Students are no longer urged to “uniformly” cultivate moral and religious character; perhaps this phrase was modified to create a greater sense of individual responsibility within the student body. From his address to the Board of Trustees on May 27, 1914, one may surmise that Dean Robbins may have made the changes in the Oath in conjunction with his vision of a revised educational plan. In this address, Dean Robbins refers to a block system newly in place and notes that “the old-fashioned lecture system does not to-day hold the place of unquestioned precedence as an educational agent which it held a generation ago (GTS Trustees’ Proceedings 1909-1914, 464).” He writes of engaging men “in questions which are of vital moment in the thought of the day” and asks whether the seminarian should “ignore [social and economic injustice] and live in a realm of pure theory which makes little or no appeal to the interest of the men of whom he will shortly be appointed spiritual leader? (465)” By these comments, we can see that GTS leadership was considering the curriculum and pedagogy in relation to the spiritual growth of the student body. The following year, in the May 19, 1914 Trustees Proceedings, another of Dean Robbins’ remarks sheds light on the revisions to the matriculation statement. He refers to one aspect of his earlier paper on theological education, in which he omitted “all reference to the discipline moral and devotional which the Seminary is bound to give in preparing men for the priestly life.” Robbins remarks that “the omission was deliberate” and explains that “the devotional atmosphere of a Seminary is to[o] delicate and impalpable a thing to lend itself readily to expression in words, but here is an influence quite as important as any exercised through lectures and library.” It seems as though the Faculty hoped to include a formal lecture program on moral discipline; however, Dean Robbins responds that “explicit instruction is given to the Juniors at the beginning of their course, and constantly opportunity is offered at informal meetings in the Chapel for frank and direct guidiance [sic] in matters pertaining to the whole discipline of the spiritual life (573).” From this, it seems logical to conclude that Dean Robbins may have wanted to simplify the oath in order to match his academic vision. While this statement is quite similar to the 1914 revision, the major change is that the phrase “to prosecute the studies, and to perform the duties, which may be required of us” is deleted. 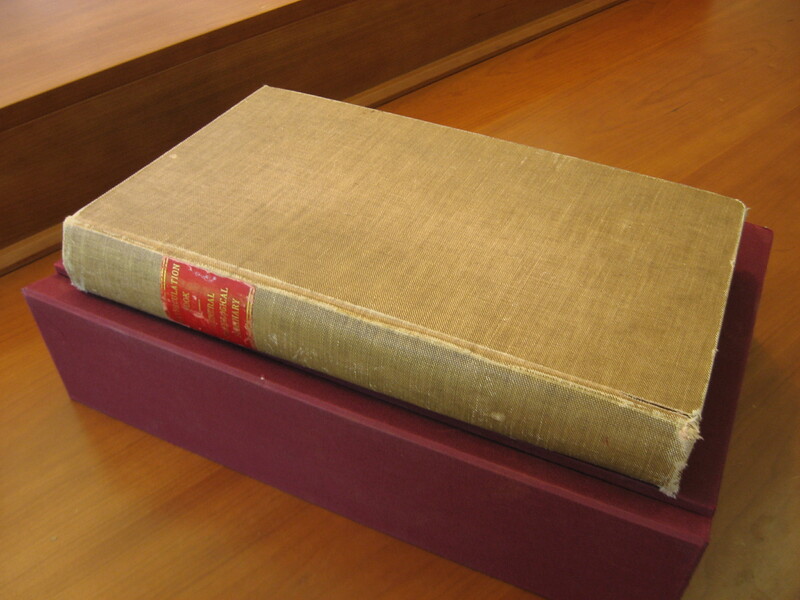 The Matriculation Book as object. The book itself is an early 19th century ledger book, rebound sometime in the late 19th or early 20th century. Its paper is machine-made and delicate (wood pulp paper produced during this era is notorious for being brittle). There are 278 double-side manuscript pages, along with approximately 25 blank pages. The Matriculation Book has a special place in the hearts of our students and alumni, but it is not the earliest record of GTS students. There are several other journals and ledgers in the GTS Archives of the Keller Library that list students along with their biographical information and postulant status. One of these, a student list for years 1822-1851, is currently on exhibition at the Library. Written in Clement Clark Moore’s hand, this document notes the date each student began and ended his term at General. Also included are notations as to where the student went after seminary. On the page displayed, we see that John Henry Hobart (Jr.) was a Middler when Arthur Carey was a Junior; both men graduated. Hobart, along with James Lloyd Breck and William Adams, went to Wisconsin after graduation and established Nashotah House. At his ordination, Carey was accused of supporting Roman Catholic doctrine and put on trial, exonerated in 1843 by Bishop Onderdonck. Ordained a deacon in October 1843, Carey took ill that fall and died on the way to Cuba, where he had sailed to recover his health. He was buried on Good Friday, April 5, 1844, having died at the age of 21. If you have a chance this spring or summer, do stop by the Library to see our exhibition showing aspects of the Penguin Life from the nineteenth and twentieth centuries! Dawley, Powel Mills. The story of the General Theological Seminary; a sesquicentennial history, 1817-1967. New York: Oxford University Press, 1969. Proceedings of the Board of Trustees of the General Theological Seminary of the Protestant Episcopal Church in the United States. New York: General Theological Seminary, 1909-1914.